This tool combines an independent test framework and a testrunner to execute the tests on many different environments and devices. 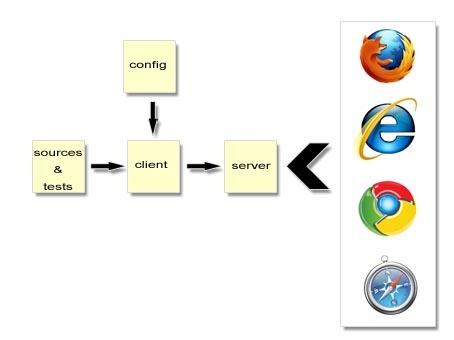 Therefore the tool starts a simple HTTP server to connect with your browser. 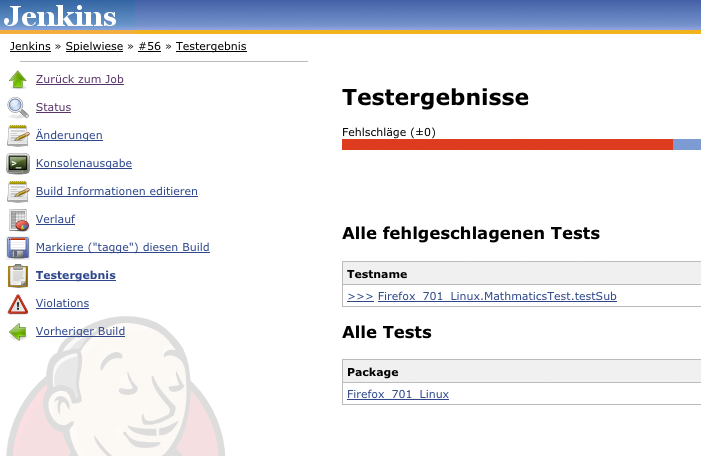 From this point your browser is marked as a “browser to test”, this process is called “capturing”. There are only two steps left to run tests on the captured browsers. Step one is to write down some tests and step two is to trigger the execution of the tests from the command line of your system. Furthermore for jsTestDriver it doesn´t matter whether you are executing your tests from Windows, Mac or any Linux operation system you can capture a browser form any remote system or a mobile device. By the way, it´s not strictly needed to add a browser by visiting the “capture page”, it´s also possible to pass the path to the browser to an optional command line parameter (–browser). 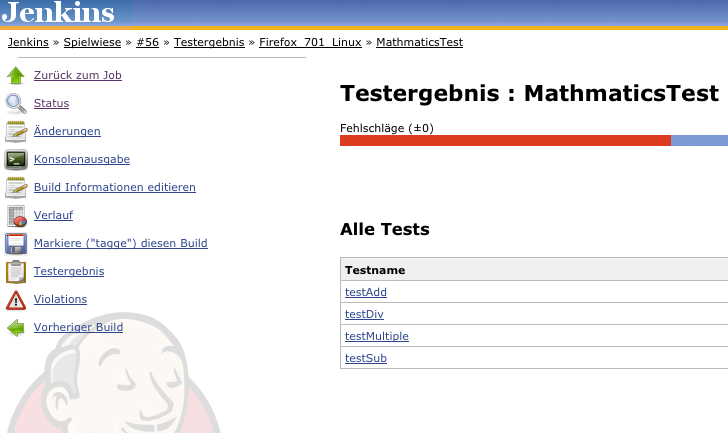 In this case jsTestDriver will open the browser, execute the tests and shut down the browser. For writing the tests jsTestDriver provides a huge amount of assertions but it´s also possible to write the tests with nearly every test framework of your choice by using an adapter for it. By starting the tests, all tests will be sent over HTTP to all captured browsers and executed, the results will be sent back to the server and will be displayed by default at the screen. 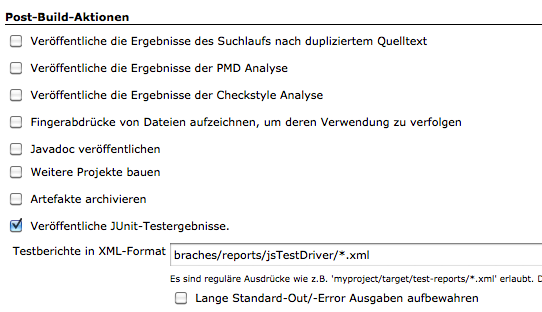 An export of the results into a XML file is also possible. 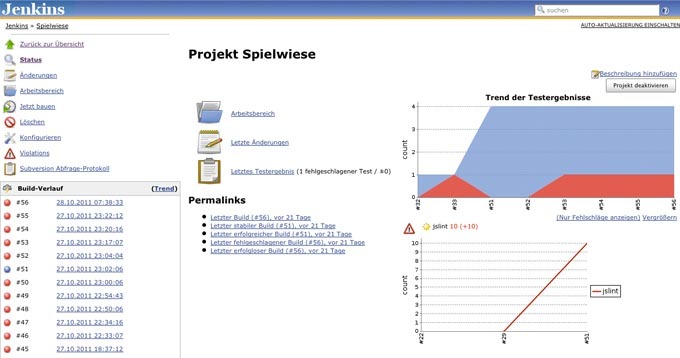 A sample definition of an ANT task could be found at the homepage of jsLint4 [http://docs.jslint4java.googlecode.com/git/2.0.1/ant.html]. Important for this configuration is the node target with it´s attribute name, because this is the value you have to enter into the Jenkins configuration. In addition, see the jslint node, where you can configure the strength or weakness of your analysis via the attribute options. Whereas the node formatter defines where the XML output should be saved, the fileset node defines the directory with the source code file that should be checked. That´s all for jsLint. This ANT task executes the tests on the defined browsers. Also it writes the output into the defined directory. 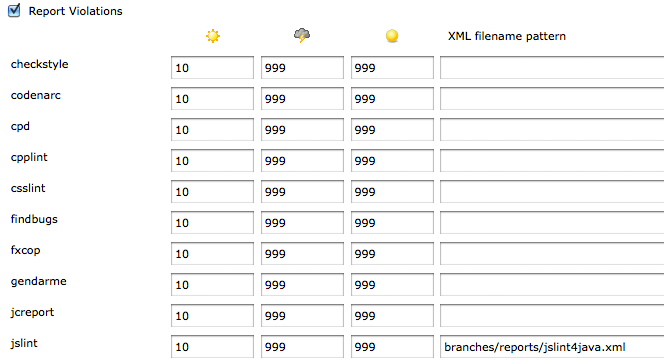 And that´s all for the moment, all other needed steps have to be done in Jenkins, and that´s also easy.